Everyone knows that cookouts, picnics and backyard barbeques are a summertime tradition. These events – and the food brought to them – may be the reason why summer is considered so many people’s favorite season. From the variety of fresh seasonal produce to delicious, fall-off-the-bone grilled meats, it’s easy to see why summer cooking remains a pinnacle of culinary perfection. However, it can be easy to fall into the same hum-drum routine year after year. Switch up your cookout menu with these five exciting, savory and easy-to-make summer-inspired recipes! Grilling can be an intimidating cooking method for many people. It is extremely difficult to find the perfect balance between soft and juicy and seared and well-done. So, before you work your way up to steaks and briskets, take the fear out of grilling with these simple Fajita Chicken Kebabs! White meats like chicken are some of the easier meats to cook on the grill and are easy to allow you to experiment with a variety of grilled veggies, different kinds of marinades, and delicious spices. These south-of-the-border inspired kebabs will add a unique and flavorful kick to any summer shindig and can be completed in just 10 minutes! Cut the boneless chicken breasts into small pieces that will easily fit onto the skewer. Then, place into a large zip-lock bag. In a small bowl, mix your canola oil, lime juice, chili powder, cumin, garlic, jalapeños, and salt together thoroughly. Pour the mixture evenly over the chicken and seal the bag immediately. Gently squeeze the bag to evenly coat each piece of chicken with the marinade. Refrigerate the bag for 30 minutes (or overnight). After refrigeration is complete, heat your grill to a medium-high temperature. While the grill is warming up, cut the bell peppers and onion into ¾ inch chunks and then add them onto the skewers alongside the marinated chicken breast pieces. Place the kebabs on the grill, pull down the cover and let them cook until the chicken is no longer pink on the outside and on the inside. The skewers should cook for about 6-8 minutes depending on how high your heat is, and they should be flipped once or twice during cook time. Remove the kebabs from the grill and place them on a large serving plate. Garnish the chicken kebabs with your fresh cilantro, salsa, guacamole or other topping of your choice. Just the word “ribs” alone gets my mouth watering. What is Cheerwine, you ask? Cheerwine is a southern cherry-flavored soft drink made in North Carolina. The beverage has been in production since 1917 and has become a popular southern favorite among many southerners, both young and old. A fun and sweet take on a southern barbeque classic, sweet heat Cheerwine baby back ribs is a surefire way to please everyone at your cookout and will have them coming back for more in no time – just make sure you stock up on wet-naps beforehand! Dijon mustard / 1 tbsp. Begin by preheating your oven to 325 degrees Fahrenheit and then thoroughly mix together your paprika, chili powder, dry mustard, garlic powder, ginger, 4 tsp of salt, and 2 tsp of pepper into a medium-to-large-sized bowl. Sprinkle 2 tbsp. of the mixed spices onto the ribs evenly and place the meat on a large rimmed baking sheet (the rims will prevent excess oil and fat from dripping off into your oven). Wrap the meat tightly with aluminum foil and bake until tender. This step should take about 2 or 2 ½ hours. Upon completion, remove the foil and leave the ribs to rest for about 30 minutes. Combine the Cheerwine soft drink, tomato sauce, brown sugar, Dijon mustard, chili-garlic sauce and 1 tablespoon of the spice mixture in a medium saucepan. Bring the mixture to a boil over high heat, and then gradually reduce the heat and simmer, stirring the mixture occasionally until it is reduced to 2 cups. This typically takes 25 to 30 minutes. Heat your grill to a medium temperature. Grill the ribs, basting them with 1 cup of the Cheerwine sauce and turning them over frequently. The ribs should appear lightly charred – this takes about 10 to 15 minutes. Transfer the ribs to a large serving plate or platter and cover with whatever remaining sauce you have! Is there any better way to celebrate grilling season than with steak? 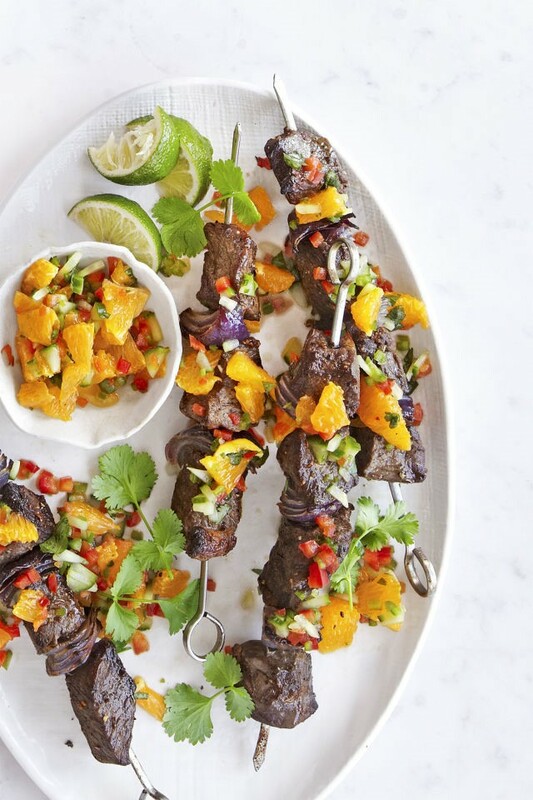 These quick and delicious broiled steak kebabs with orange relish give a refreshing and vibrant spin to an American barbeque favorite. 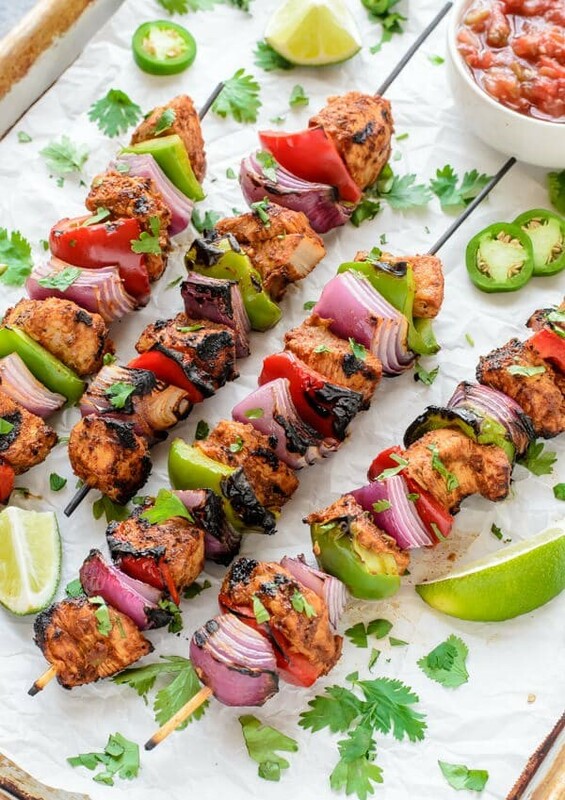 Whether you’re looking to switch up your barbeque menu or aiming to impress your guests with your culinary finesse, this innovative take on a classic kebab will surely make you the buzz of the cookout! Jerk Seasoning / 1 tbsp. Canola Oil / 2 tbsp. Olive Oil / 1 tbsp. In a medium-large bowl, thoroughly mix together 1 ½ cups of chopped orange segments, ½ cup of chopped cucumbers and red bell peppers, ¼ cup of freshly cut cilantro, ½ minced jalapeño, 1 tablespoon of olive oil, salt and ground black pepper. Gently toss together your 2-lb. sirloin (cut into 1-inch pieces), ½ red onion (cut into 1-inch pieces), 2 tablespoons of canola oil, 1 tablespoon of jerk seasoning, and salt and black pepper. After doing so, thread the meat on medium-sized (about 8-inch) metal or wooden skewers. Broil the skewers on top rack of grill, turning them once during the process, until they are medium rare. This should take between 10 and 12 minutes. Simply remove the skewers from the grill rack and garnish with seasoning, cilantro, and lime wedges as you please! Ahh, Cheeseburgers: The shining star of American cookouts everywhere. Is your summer really complete without one of these juicy burgers? We sure don’t think so! Cheeseburgers are found at almost every summer get-together, no matter who’s in attendance or how big the crowd is. 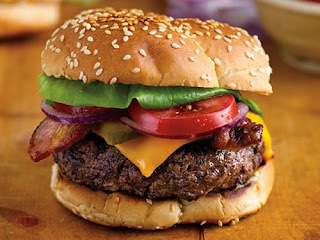 While many grill cooks have perfected their hamburger techniques, many still struggle at making the perfect summer cheeseburger. That’s why we’re here to help! Follow these simple grilling instructions and be on your way to being the hero of your next backyard cookout! Keep your meat cool – the amount of time between removing from the fridge and grilling should be minimized as much as possible. Ground beef will immediately start to lose its freshness as soon as it leaves the cold temperature of the fridge. Washing your hands with cold water before handling your patties is a great way to ensure the meat doesn’t lose its natural flavors or freshness, but be mindful that you should handle the meat as little as possible when shaping your patties. Compressing the meat too much will lead to dense, dry burgers – yuck! Burgers are already rich with flavor, so keep the seasoning minimal. Burger experts usually only use nothing more than sea salt and fresh, coarsely ground black pepper to season their patties. You should save your creative flair for the garnishes and not compromise the beef’s natural juiciness. Lightly brush the burgers on both sides with melted butter (the amount is dependent on your personal preferences). Doing so helps prevent the patties from sticking to the grill and adds an extra layer of delicious flavor. Pro Tip: No matter how much you are tempted to do so, NEVER press the patties with your spatula while they are grilling! This compromises the patty’s juiciness and will make them dry and dense in the long run. After about 2 minutes on the grill, give the patty a quarter-turn to get those beautiful grill marks you see on posters and in commercials. After doing this, try to flip the burger only once during the grilling process. When the edges begin to brown or you see a few little pearls of blood bleeding through the top of the patty, the meat is ready to be flipped. Make sure your burger is cooked to perfection! Medium and rare burgers sure are tasty, but you don’t want a burger too pink or red. Try using an instant-read thermometer to get the best idea of when your burger is thoroughly cooked and ready to be eaten. Stick the thermometer into the thickest part of the patty (typically the center) and make sure it reads at least 160 degrees Fahrenheit. Gently glaze your buns with butter and lightly toast them on the grill for optimal taste. You can either melt the cheese directly onto the patty or infuse your ground beef with cheese to keep the patty’s juiciness and add a flavorful punch that everyone will enjoy. Once completed, remove all meat and bread from the grill and garnish the patty with your favorite dressings. Voila – a simple, beautiful cheeseburger that will please even the toughest crowds! It’s no secret that every cookout aficionado is a fan of ribs. 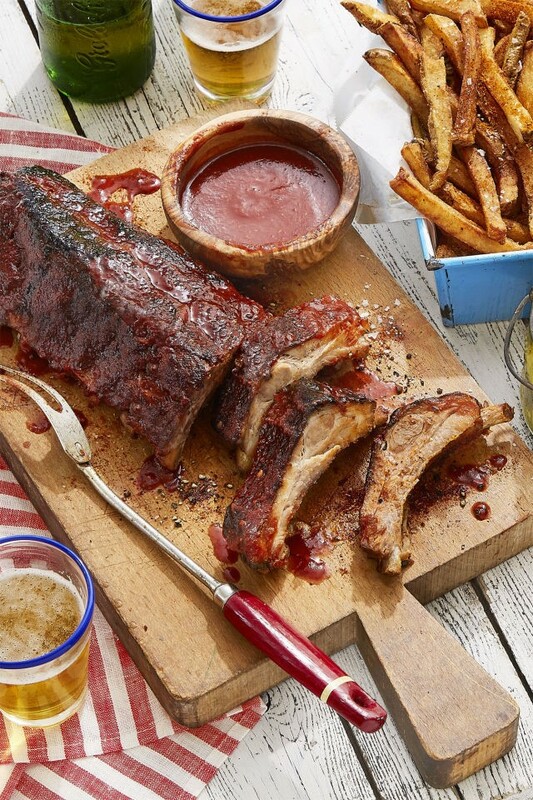 Crispy and sweet, ribs are the perfect dish to please every cookout attendee. 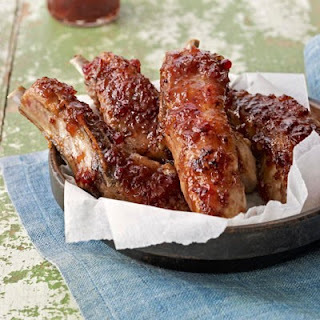 These glazed country ribs give an inspired twist to a country-style favorite. Brushed with a red-currant glaze and seared to perfection, these ribs will give a tangy kick to any event! Canola oil / 3 tbsp. Fresh ginger, grated / 4 tsp. Sherry vinegar / 4 tsp. Freshly ground pepper / ½ tsp. Begin by preheating your oven to 300 degrees Fahrenheit and chop 1 onion into 1-inch pieces. Place ribs, chopped onions and garlic in a 9 x 13-inch roasting pan with 1 ½ cups of water and cover tightly with aluminum foil before placing in oven. Braise until ribs are very tender. This should take roughly 3 ½ hours. For the Red-Currant glaze, chop your remaining pieces of onion into tiny little bits. Heat canola oil in a small pot over medium heat and add onion, cooking it for about 6 minutes until the pieces are soft. Add ginger to the mixture and cook for one additional minute. You can now stir in the remaining ingredients and simmer for about 5 minutes. Remove the pot from the heat source. Remove the ribs from the pan, discard onion and garlic pieces, and drain the remaining liquid from the pan. Increase the oven’s temperature to 350 degrees Fahrenheit and place the ribs back onto the pan, coating them evenly and generously with the glaze. Place the meat in the middle of the rack for optimal cooking temperature. Continue to baste the meat with the glaze every 10 or so minutes for up to 30 minutes. Serve the ribs alongside a ½ cup of reserved glaze.